THAT'S JUST $8.33 PER MONTH!!! AFFILIATE CUSTOMER REFERRAL PROGRAM: Because our business succeeds with word of mouth advertising we provide our customers a referral program whereby we will pay YOU a $15.00 referral commission every time someone orders a personalized copy of our replicated website using the link at the bottom of YOUR website. And, we pay a $5.00 referral commission for every 2nd level order (someone orders from one of your 1st level referrals). We also pay referral commissions each year based on the annual subscription renewal of your referrals. So get your site now and then start sharing it - be sure all your distributors get one from you! With just a few referrals, you will receive enough referral commission to pay for your annual subscription - sell more and you will have pocket change! We'll set it up for you. You make your payment at PayPal and provide us some information, then we'll complete the setup within about 24 hours. Carefully follow the instructions that follow. We recommend you PRINT the instructions before proceeding. SUGGESTION: PRINT this page as a step-by-step guide while you sign up. 1. Verify you have a working PayPal account. Log in at www.PayPal.com to create a PayPal account if you do not already have one, or to ensure you can sign in to your PayPal account and that your account is active. Because the website is available on a "subscription" basis, payment can only be made through PayPal. 3. Make a note of your Entrenet Membership ID. 4. Fill out the form below, being sure to enter your new Entrenet Member ID, then click submit. 5. Watch for a BUTTON to proceed with your order - you must press it when you see it in order to proceed to PayPal. 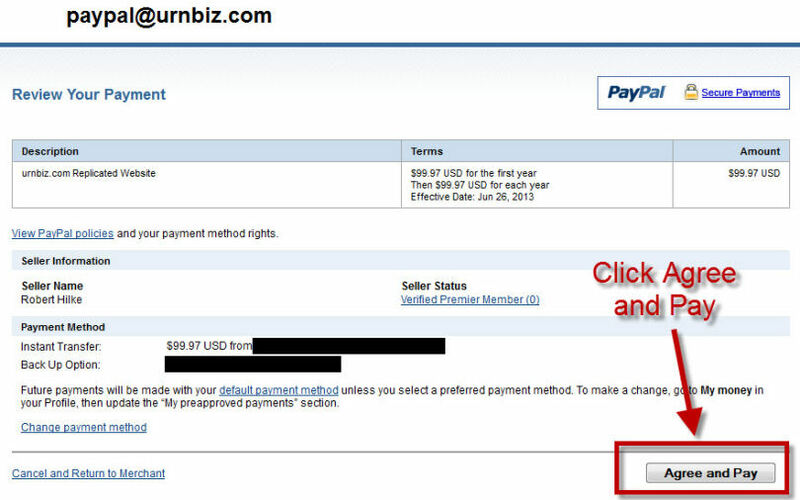 You will then be taken to a payment page at PayPal where you can choose your method for payment. 6. Watch for the message on Paypal upon successful payment to return to the merchant website. 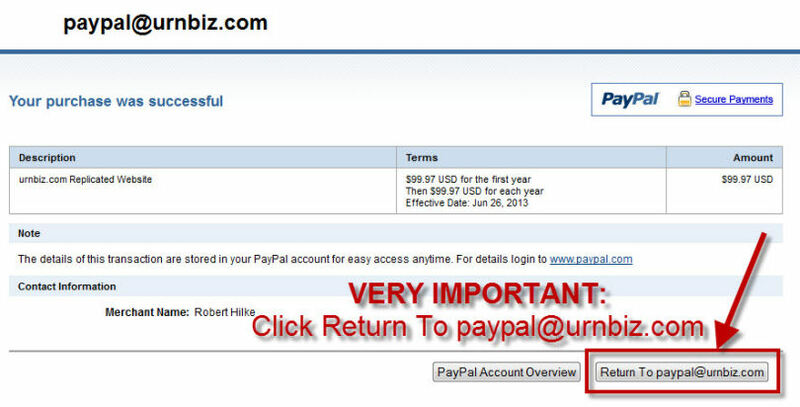 Normally, once PayPal acknowledges your payment was successful there will be a button toward the bottom right of the page that says to "Return to paypal @ urnbiz.com". Be sure to click that button! You need to do this step in order for the system to automatically complete your new website. If you fail to do this step, you will need to call for assistance which will delay the creation of your website... 800-584-3596. 7. 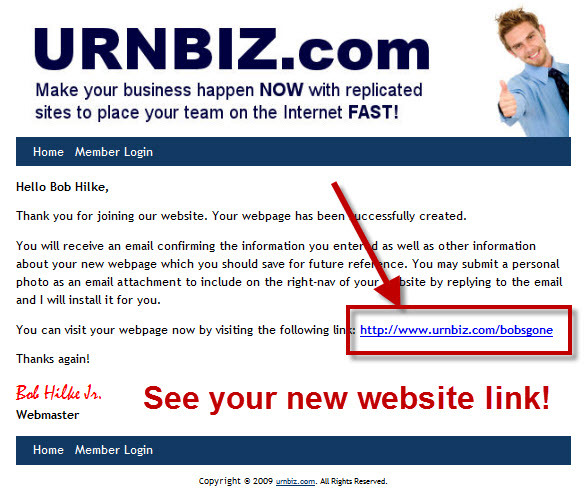 You will receive an email from http://urnbiz.com confirming the information about your new website and providing the URL (link) that you will use to send out to your prospects. That's it - hopefully that was not too complicated. If you were expecting more, sorry to disappoint you! Fill out the following form to get your website. Note: this is the name of the person who's website you were just at - this is not necessarily who you are already sponsored with in Entrenet, and that is OK because this is informational only and just lets us know where you found our website. Check this carefully to be sure it is spelled correctly because your website cannot be created unless your email is a correct email format. Common mistakes include having extra spaces at the start or end or between words, or not having the @ sign or a correct extension at the end. This must be the email address you sign into PayPal with, so please get it right because we'll use this email to send commission payments to you for your Affiliate customer referrals. Common mistakes include having extra spaces at the start or end or between words, or not having the @ sign or a correct extension at the end. This is likely a 5-digit number that you received when you signed up at Entrenet. Usernames are 4 to 14 characters long and can be any combination of digits (0 to 9) and/or letters (a to z) only. Usernames are all lowercase. Spaces, periods, forward slashes (/) and other characters are not allowed. If you enter "reallycoolsite" in this field, your new URL will be this: http://urnbiz.com/reallycoolsite. Passwords must be 6 to 12 characters long and can be any combination of digits (0 to 9) and/or letters (a to z) only. Passwords are all lowercase. Spaces, periods, forward slashes (/) and other characters are not allowed. BEFORE PROCEEDING WITH SUBMIT, PLEASE READ BELOW TO SEE WHAT HAPPENS NEXT SO YOU KNOW HOW TO GET TO PAYPAL AND WHAT TO DO ONCE YOU HAVE PAID AT PAYPAL. DO NOT CLOSE YOUR BROWSER UNTIL YOU HAVE COMPLETED ALL THE STEPS BELOW AND ARE LOOKING AT YOUR NEW WEBSITE IN YOUR BROWSER. By Checking this Box, I hereby Agree to the Terms and Conditions. It is very important once you press SUBMIT that you go through all the steps that follow or your website will not be generated. DO NOT CLOSE YOUR BROWSER!!! WARNING: DO NOT CLOSE YOUR BROWSER!!! OK - YOU SHOULD BE DONE! BEFORE you press SUBMIT, be sure that you have a PayPal account and that you are able to log into it. If you do not have a valid PayPal account set up first, then you may lose the information you typed in the website form. Once you have a PayPal account established, view this page we prepared for you so you know what to expect... Payment Submission Process. You may wish to keep the page open in a separate browser window to refer to it during the payment process. The SUBMIT button will take you to PayPal. 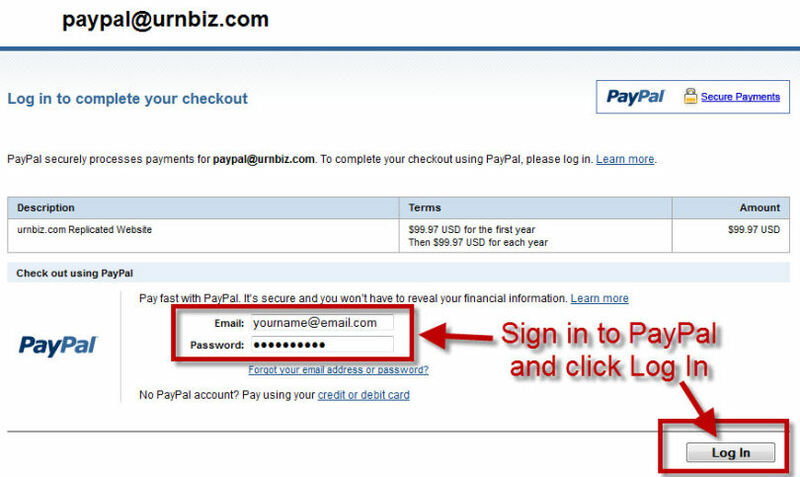 You will need to enter the email address your PayPal account is registered with, as well as your PayPal account. Once you arrive at PayPal, log in to your PayPal account and follow the instructions to make your payment. Once Payment has been made, PayPal will provide a BUTTON that you must use to RETURN to our website. Once you press the RETURN TO MERCHANT button (may say "RETURN TO PAYPAL @ URNBIZ.COM", you might receive a pop-up notice informing you that you are moving away from PayPal to a non-secure page. This is fine, so please acknowledge the informational pop-up in order to move on. You will now be presented a page that is mostly white and which has a button in the TOP-LEFT which you must PRESS to create your website. Your website will be immediately created at that point and you will be presented with a Thank You page that contains a link to your new website. You will also receive an email with your website information. If a "Member Login" link to your website back office is found at the bottom of every page of the website. You will need your user ID which is the user name you gave your website (for this website... http://urnbiz.com/yourname, the username is "yourname") and your password to enter the member area. Once in the member area you can modify your custom fields and find resources to promote your website. If there are any problems creating your website, please contact us for assistance.